The famous Red Helmet is an example of how you can make something good out of nothing. I’ve had this red football helmet, made of plastic, since I was 6 years old. It’s survived quite a bit over the decades and has now taken on an aura of its own. 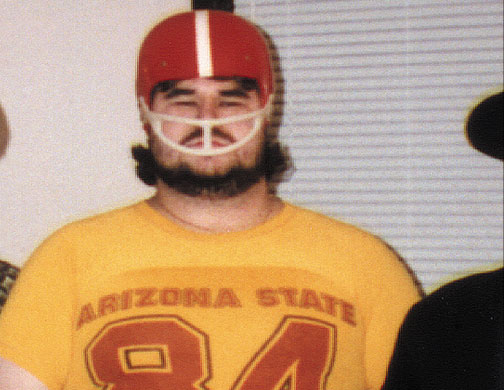 Wearing the helmet for photos began at a memorable Halloween party in 1995. For this party, my costume was the world’s oldest pee wee football player. I wore the helmet, which was extremely tight on my head, as part of my costume, along with extra tight jersey and pants all in attempt to appear overgrown. Soon enough after that Halloween in ’95, everyone wanted to try on the old plastic helmet for themselves. Since then, documentation of human interaction with the red helmet became a natural development. This collection of images took off from there and I’ve been taking these pictures for almost 20 years! Most subjects are friends of mine, some are strangers. They are not posted in any particular order. I always thought of turning these into a funny coffee table book. Until that happens, I have this blog as a place to post the collection one photo at a time. The helmet is sitting here on top of my studio bookshelf waiting to be brought out for photographs at the next appropriate time. The Famous Red Helmet cannot be forced on the unwilling. However, you can easily see that at the right moments, no one can resist the power the Famous Red Helmet. Even if the right moment is not a moment you remember. Look at these photos – the Famous Red Helmet does not tell lies. Click on the link above or Red Helmet in the category menu to see the photo collection. Some of you might even recognize yourself and a few other people from the present and the past. Here is the picture that started it all. This photo was taken in 1995 at Paul Smith and Jerry Stanley’s Halloween party located in wild, weird Sidney, OH.